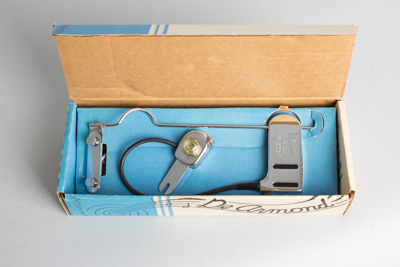 DeArmond Model FHC Model Archtop Guitar Pickup, c. 1970, made in Toledo, Ohio, chrome finish. A cool find, looking virtually unused still in the original box with paperwork. The original cable is included but does not work; a newer one is provided as well that does. Excellent + Condition.